It's kind of old news, but I finally was able to finish typing this up! 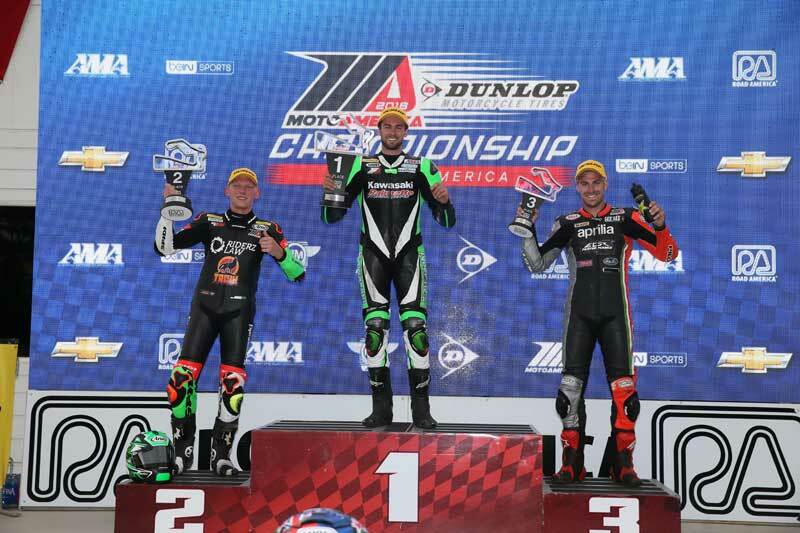 Last month on June 3rd, I earned my second career pro podium in the MotoAmerica series with a 3rd place finish in the Stock 1000 race at Road America! This was my first Stock 1000 race, and my first MotoAmerica race of the year. My last podium in MotoAmerica came back in 2016 in the Superstock 600 class. It had been a full two years, and it felt amazing to pull it off at one of my favorite tracks in the country, Road America in Elkhart Lake, Wisconsin! My dad and I drove the motorhome and trailer all the way from Oregon to this race because it fit into my schedule this year, and it's one of our favorite races in the series. The track is the longest on the circuit at 4 miles long, and the facility is flat out world class. The fan turnout is always great, and its overall a really enjoyable place to be at. It's over 2,000 miles each way to get there and home, but it was a nice change of pace versus driving to California for the millionth time. I love driving through northern Idaho and Montana. Stock 1000 is a new class this year. They essentially split up Superbike and Superstock 1000 that used to race together on track at the same time. The rules of Stock 1000 and Superstock 1000 are different. Superstock 1000 has been eliminated with Stock 1000 replacing it. The bikes are more "stock" to put it as simply as possible. We don't get to run the fancy aftermarket brakes and our motors are nearly untouched. But our bikes are still wicked fast and a lot to manage. With one race per MotoAmerica weekend and limited track time, each rider has to make each lap count, and keep it on two wheels. My goal was to podium, and I sure didn't want to crash out of my only race after driving so far. The weekend started out very well and fun. We got to the track Thursday to load in with everyone. I didn't hit the track until Saturday morning, so I got to sit back and relax, and watch everyone get to work come Friday. It's always fun catching up with friends in the series! Saturday morning practice was a bit sketchy, as it was misty and damp. But it was very deceiving, and the track dried out quickly. I have been to this track before, but it had been a couple years since my last visit, and it was my first time racing a 1000 at Road America. I ended the session in 5th, respectively. The afternoon qualifying session was perfect conditions, and it was time to really get up to speed and reacquainted with the track now that I could comfortably push. I was out by myself the entire time. The track is so large and with about 18 riders in the class spread out over 4 miles, you feel pretty lonely. I qualified 5th place, right on the heels of my competitors! Sunday morning I had qualifying 2. My goal was to improve my time and starting position. Normally my plan is to try to get a tow from a faster rider to improve my time. But it wasn't working out, and with limited time in the session, I forced myself to put down the fast laps on my own. And I was able to do just that, improving my lap time lap by lap running solo. I got down to a 2:18.6, which bumped me up to the front of row 2 in 4th place! I was less than a second off pole. It was my best qualifying effort to date and I was so happy with how I executed the session. My R1 was working awesome for me, and I was really feeling comfortable out on track. Finally the race had arrived, and boy was I excited! I had a great feeling and I was ready for some fun. I got a great start, moving up into 2nd place into turn 1. I nearly took the lead into turn 3. As the pack and I came barreling down the hill into a very tight turn 5, I nearly hit the rear tire of Andrew Lee as we got on the brakes. I had a big draft on him and it sucked me right into his back tire nearly. I fell to 3rd as I went wide into the turn to avoid Andrew. After a couple laps, it was a 5 rider battle for first. I was in 3rd right on the heels of the Kawasaki riders of Lee and Richardson, with Wyman and Dominguez on my tail. Wyman was on the move. I was now in 4th fending off Dominguez, who I eventually dropped as I clung to the back of the leaders. I was comfortable in 4th place, knowing there was more than half the race to go still. I didn't want to make any rash moves, and all of a sudden Wyman who had moved into the lead, crashed out, moving me back into 3rd place. My goal was to podium, and the position was just handed to me. I came past the front straightaway to read my pit board, which showed me I was increasing my lead over 4th place. I continued to pace the leaders for a little while, but was growing tired at the same time. I decided I was happy with 3rd, so I rode a steady pace and continued to grow that gap. But I wasn't push as hard as I was before, and the leaders began to pull away. I felt I might've been able to challenge a bit longer, but I didn't want to be greedy my first race back in the series and throw it away. I rode it to the checkers for 3rd place, meeting my goal of a podium! The cool down lap after the race when you get a podium is the best feeling. You get to congratulate your competitors, do wheelies, wave at the fans, and celebrate! For the second time in my career, I got to ride into the winners circle, where I was greeted by my Dad and my friends John and Jack Roach! Hugs and high-fives were given as I got off my bike and got my helmet off. A swarm of fans, MotoAmerica personnel, mechanics, pit crew members, and photographers swarmed me and the other winners. I was filled with joy as I climbed on the podium for my interview. After our speeches and trophy presentation, we sprayed our champagne before being carted off to the press conference. The whole experience is pretty surreal. You feel like an absolute Rockstar with everyone congratulating you. Needless to say, the long drive back home wasn't too bad with a trophy in hand. I am looking forward to going back to the MotoAmerica series in August to race at Sonoma Raceway in California!